This unit has it all! Amazing view of the ocean from the balcony, living room, kitchen and master bedroom and a river view from the guest bedroom, kitchen and front door. Also, enjoy the large pool (not heated, but ideal for swimming almost year-round) 50 feet from the ocean and right outside your balcony. If you want a view of the ocean then look no further. 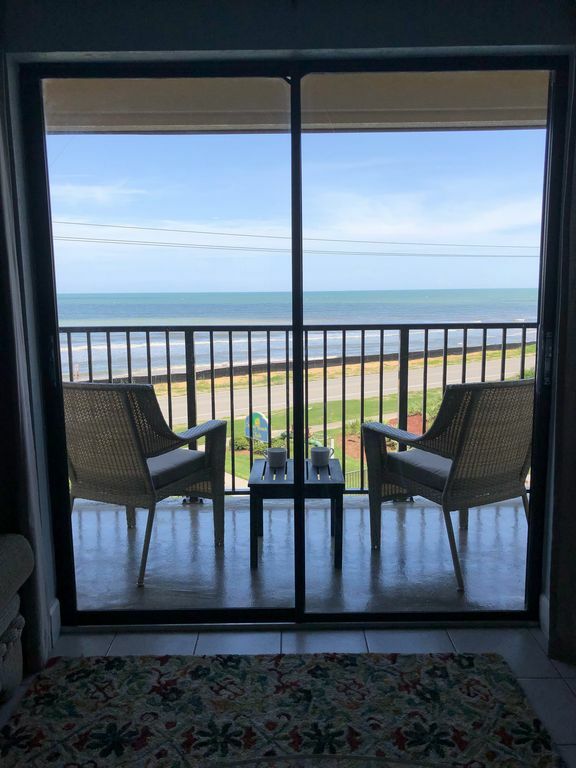 Sit on the large oceanfront balcony and enjoy watching the sunrise over the ocean or enjoy the sunset over the Halifax River from the front entry balcony. This sparkling clean 2 bedroom/2 bathroom 3rd floor unit has been recently remodeled and updated throughout. The balcony overlooks the large swimming pool and the beach. Watch dolphin swim just off the shore from the comfortable balcony or living room. Direct beach access is directly across from the unit and is less than 100 feet away. Lighting fast WiFi (100 mps +) is included for those that want to stream NetFlix or Hulu on the large high-def 4k TVs located in the living room and master bedroom. A new kitchen with all stainless steel appliances and a Keurig coffee maker awaits you. A washer/dryer is located in the unit to make your laundry an easy task. You can lay in the master bedroom and open the private slider door and hear and watch the waves as you relax in the ultra-comfortable king sized bed. This unit has it all. Don't look any further to experience all that Ormond Beach has to offer. Minutes to all of the regional attractions - Orlando and Disney/Universal is an hour drive...Daytona is 10 minutes away...St. Augustine is 20 minutes away. Ormond Beach is a recreational paradise - kayaking/canoeing, paddle boarding, freshwater and saltwater fishing, golfing, snorkeling/scuba diving, swimming, bicycling, pleasure-riding on A1A or the beach, surfing, running wooded trails or under majestic oak and palm canopy roads - Ormond Beach has it all. Ormond Beach has a wonderful "main street" area on both the mainland and the beachside. Great dining and shopping in locally owned establishments. Foodies will love this place! There are also most of the well-known chain stores and businesses within a 15 minute drive. If shopping is your thing then you will love the area. The Tanger Outlets are a short 20 minute drive away and the region is packed with all the shopping you could want. The biggest appeal of Ormond Beach is that you get all of these great amenities in the region, but you don't have to deal with the traffic and touristy feel in Ormond. Ormond Beach is a peaceful, slow-paced "old Florida" beach town. Great for families and children. No smoking in the unit or on the balcony. Beach umbrella, chairs and other beach toys, games and puzzles are included. Located at 2730 Ocean Shore Blvd, Ormond Beach, FL. Right on the Atlantic Ocean! We live in Orlando-about an hour from this beach condo. We bought this unit and renovated it in late 2018. We look forward to you enjoying your time here at Sandy Feet Retreat as much as we have! toilet, shower, Storage. Great water pressure and updated. toilet, tub, shower, Great main bathroom. Great water pressure and large tub. Ice cold air with a Nest thermostat. Super comfortable linens on all beds . Elevator access is about a 10 second walk from the front door. Comfy living room. Large 60 inch 4K Smart TV. 2 couches. Queen sleeper sofa. Stainless. New in 2018. Ice maker included. Kuerig and regular coffee maker both on-site. All new dishes and utensils in 2018. Updated and all stainless appliances. Plenty of storage. 60 inch 4K Smart TV in living room and 50 inch 4K Smart TV in master bedroom. Large balcony with seating, ring toss game and ocean and pool view. Many kayak and canoe rentals nearby. Front door patio overlooking the river. Water sports gear stores less than 1 mile away. Large clean pool just outside your balcony. Plenty of patio chairs and full sun most of the day. Not heated. The location could not have been better. The condo was beautiful and super clean inside. The view from the balcony amazing, the waves, the smell, watching the dolphins and pelicans was such fun. Collected many shells on the beach. The owners were so nice, and so helpful. I would like to thank them. It was a very lovely and restful vacation. We are so glad you enjoyed your stay. We hope you return in the future. Thank you ! It has all the amenities that you need gor your stay and its very clean. I recommend this condo if you are visiting Daytona Beach. Im sure the next time we come to Daytona i will be booking this condo. Wow! Thanks for the kind words. We love our little piece of oceanfront paradise to! Thanks for the great review. In the future be sure to let the owner know when there is an issue. I am glad I reached out to you about the air conditioning and was able to get it fixed within 12 hours. Thank you ! The condo was wonderful! Great location and tons of amenities. We’ll be back! Thanks for staying with us and for the great review!! The unit exceeded all expectations. It was obvious a lot of thought was put into the decorations and the instructions. Everything was well organized and a pleasure to stay here. The only problem is that since it was the best unit we have used for many years, the bar is now so high, it will be hard for others to match. We appreciate your amazing review. We take great pride in providing the best vacation rental in the area! Very nice and well maintained oceanview condo. Ocean access right across the street. Very good location just north of Daytona with restaurants and bars nearby. Owner was responsive to our needs. The only issue was that the pool was not heated which disappointed my wife. Overall, a very nice rental.